Our Haiti Soccer Camps give you the opportunity to grow through crossing cultures, bond with new friends through athletics, and, if you wish, even engage in community service. It also provides a chance to experience what playing soccer feels like in a different part of the world. Has your soccer team ever played against a team without shoes on? Has your team ever envisioned being defeated by kids playing with no shoes on? Read more to learn about how your kids can have the summer soccer experience of a lifetime. Although kids will learn a lot about soccer on this trip, they have the chance to learn even more about life. Chances are that the kids in your community talk about new cleats in a way that is unimaginable to a talented kid in Haiti. When we comment on the quality of the grass fields, it can be eye-opening to see incredible soccer played on a field in Haiti, even if its condition is not what our kids are accustomed to. Likewise, the crisp new uniforms we purchase are not something that can be afforded in many other cultures; in fact, few of us can relate to the food insecurity that impacts so many Haitians. In addition to playing soccer, we can schedule community service during the Haiti Soccer Camps that can include teaching summer camp, coaching basketball, building chicken coops, and more. While the typical Haitian soccer player has a lot to teach others about the game, basketball is far less common in Haiti. For those who love basketball too, this can be a fun and rewarding way to bond with Haitian children. We will also have a market day – in which we visit a Haitian market and break into small groups, each with a translator. Each person is provided with a nominal amount of money, and they experience bargaining at one of Haiti’s traditional markets. Visit Haiti Volunteer Opportunities to learn more about how we can leave a positive impact on the community we are visiting. No matter where in the US your group is from, they can serve in a way that will forever be memorable. When planning your trip, we can create whatever balance you most desire between soccer and service. If you are traveling with a group not entirely composed of soccer players, we can even run both simultaneously. We plan this trip and work side-by-side with a non-profit in Haiti with a wide reaching program in in the country, and the cost of this trip goes directly to this non-profit to expand the services that they provide. 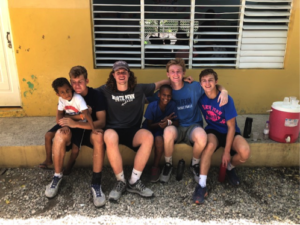 Our trip does more than provide an opportunity for sports and enrichments – it allows us to leave a positive footprint on the culture we are visiting. More importantly, it adds resources that can remarkably enhance Haitians lives. Beyond the clear benefits of the daily experiences, your group will bond in a way that is unique to international travel. Many children – and adults – may leave this trip with relationships that can create a bond that would never have otherwise existed. In Haiti, we also stay in a beachfront resort with 24/7 security. At the end of the day, your team can relax in the hotel pool or the ocean. After dinner each night we meet for reflections. We discuss what we learned about Haiti, our team, and ourselves. We give deeper examination to what this trip means to our journey and our own personal growth. This trip includes airfare, transportation in Haiti, hotel accommodations, and food. Typical airport departures can be from Philadelphia, Newark, and JFK. We run trips not just out of PA, NJ, and CT, but also from departure cities across the country. If you are interested in Haiti Soccer Camps for your players, we can offer trips from anywhere in the United States. There are particularly better deals on airfare when coming from these following locations or the surrounding areas: Chester County, Burlington County, Bucks County, Essex County Union County, Warren County, Montgomery County, and other areas. Contact us and book one of our Haiti Soccer Camps today!